Solar Energy, so far the most reliable clean energy. 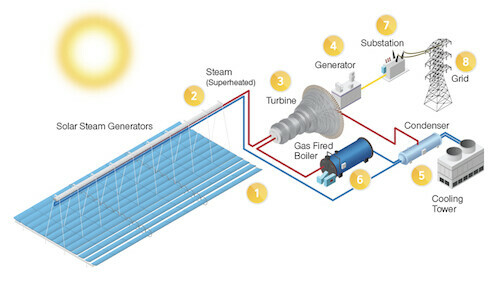 there's two kind of technology to produce solar energy, PV (Photovoltaic) and CSP(Concentrated solar power). To define those two we can say it on a simple way, PV uses the SunLight to produce energy, and the CSP Uses the Heat (Thermal). The most popular its the PV, you can have this on the roof or on the grown, does not matter if you have the sun. For some countries you will find systems with accumulators so you can have the energy for the night and cloudy days. The trend on a short terms its everybody to have solar panels and produce the energy needed by themselves. what its stopping us of going on faster and have the energy we need for everything?, well, there's a lot of interest involve with the petroleum and the energy generators. There is not a common interest of giving the energy as easy as the sun brights every day, there's people around the world with money to give, but they want more and more. The biggest solar energy countries are Germany, China and Japan. day by day science its giving big steps over this technology to provide smarter energy solutions to the world. Soon, I hope, we will have streets producing clean energy to our houses for 24hr the whole year.